In recent years we have all been encouraged to introduce more and more brightly coloured, 'muscular' plants into our gardens. These big, bold plantings are seductive in their way, but unassuming plants such as the herbaceous potentillas can bring a quiet elegance to our borders. The famous botanist, author and artist E A Bowles of Myddleton House counted them among his favourite plants. And the French nurseryman Victor Lemoine produced many cultivars to satisfy public demand at the beginning of the last century. 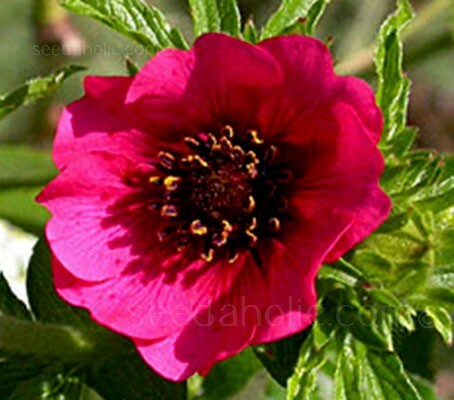 Few other herbaceous plants are as pest-free, undemanding and as long flowering as potentillas. Time, perhaps, for a second look. The nepalensis cultivars are generally the largest of the herbaceous potentillas. There are a number of forms ranging in flower colour from pale pink to luxurious deep red. They produce tidy little rosettes of pretty pleated leaves, resembling those of the strawberry, and saucer-shaped flowers that begin to bloom in early summer. While the species traipses throughout Nepal's Himalayan Mountains, this compact cultivar makes a well-groomed perennial for the garden. Venerating the former plant curator at the Royal Botanic Garden in Edinburgh, Scotland, 'Ron McBeath' is a beautiful new semi-dwarf cultivar that wears a coat of carmine-red, saucer-shaped single blooms, each defined by a dark crimson eye and five heart-shaped petals that are attractively crinkled like crepe paper. Growing to 30cm (12in) tall, it makes a handsome low mound of hairy coarse-toothed strawberry-like foliage. This diminutive potentilla is valued for its long period of bloom, it repeat-flowers for months, even in shade. Sending up wands of carmine-red flowers on branched stems and flowering from June until September, it outlasts other herbaceous potentillas by far. They are fine border plants, useful in containers and look good in a sunny cottage garden, raised bed or the rock garden. Extremely cold-hardy to minus 29°C (-20°F) they are also suitable for coastal conditions. 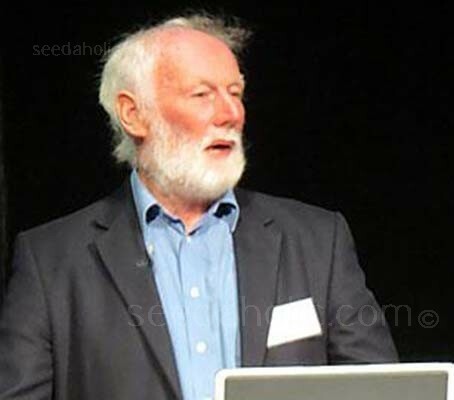 The cultivar name honours Ron McBeath, a respected alpine grower and plant hunter, and the former assistant curator of plants at the Royal Botanic Garden in Edinburgh, Scotland. Berwickshire in the south of Scotland is rather remote from Western China, but a large percentage of Chinese plants in cultivation have found their way to gardens via the great explorers of China. Ron McBeath, whose garden harbors many Chinese treasures, is among the foremost of the modern plant explorers. For decades he traveled almost yearly to China to collect for Royal Botanic Gardens, Edinburgh. He spent more than 20 years at the Royal Botanic Gardens, where he oversaw herbaceous collections and databases. Ron left RBG to found Lamberton Nursery, a rare plant nursery very near the English border. Although he has largely phased out nursery operations, he and his wife Susan have time to themselves now and have developed a marvelous private garden filled with the very best plants. Plants named after him include Persicaria affinis 'Ron McBeath' and the wonderfully named Muscari mcbeathianum. In heraldry and in architecture, the cinquefoil emblem or 'potentilla' signified strength, power, honour and loyalty. Depiction of the five-petalled flower appears as early as 1033, in the architecture of the church built in the village of Reulle-Vergy (Burgundy, France), two years before the reign of William the Conqueror. From the 11th to 14th century, the word 'potence', related to Potentilla, as above, was used mainly in a military context and to describe the condition of the soul. During the time of William the Conqueror, the potentilla was used as an emblem on the coat of arms of Bardolph of Bretagne, who in 1066 was the master of the William's military engineer corps. •	The septfoil (with seven petals) appears in the arms of the 63rd Armor of the United States Army. •	The double quatrefoil (with eight petals) is in England the seldom if ever seen cadency mark of the ninth son. Carmine-red flowers, each defined by a dark crimson eye.